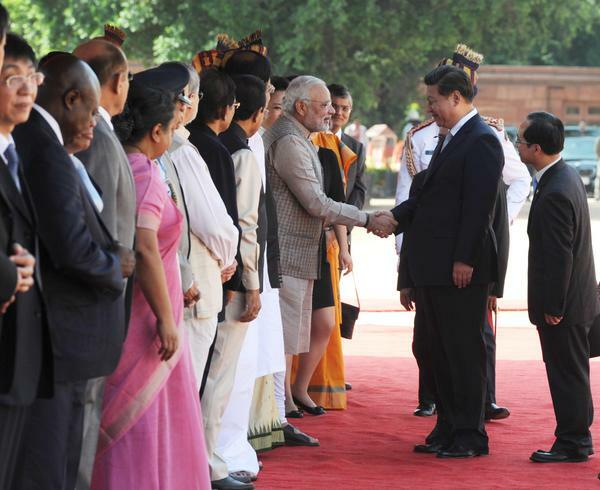 India awaited the Modi-Xi Jinping summit with mixed feelings. The meeting of the two leaders had captured the attention of all – though the prism through which both countries attempted to weigh the expectations and outcomes were somewhat different. The strategic community – exulting over the brave new era in Indo-Japanese ties inaugurated by Prime Minister Narendra Modi’s Japan visit, and the prospects of his forthcoming visit to the US – focused on how it would push the Chinese into moderating their assertiveness vis-à-vis India. The economic elite, which lately appear to be convinced of the enormous potential for expansion of trade and commerce, were also eager. Their appetites were whetted by the statement reportedly made by the Chinese Consul-General in Mumbai that China planned to invest approximately $100 billion in India. Political analysts, foregrounding the emergence of two strong leaders and their strong domestic standing, were configuring a new phase in the relationship, which would be firmly anchored in a strong economic base. And though likely to take a tough posture on the contentious boundary dispute, this relationship could possibly work out a breakthrough. The departure from tradition by welcoming Chinese President Xi Jinping in Ahmedabad, and the bonhomie generated by a huge dose of personal warmth and many lighthearted moments, appeared to exacerbate the mixed feelings. In fact, the ease with which the two leaders appeared to interact – including the celebrated few moments on the swing together – did suggest a possible personal rapport being established. This could augur well for these two leaders born in independent India and liberated China in the years ahead, especially when some blunt talk may be needed. Notably, the public enthusiasm displayed on Xi’s arrival seemed to recall shades of the spontaneous welcome given to the late Chinese Premier Zhou Enlai when he visited India in 1954. Both Chinese Premier Li Keqiang’s maiden visit to India last year and now Xi’s visit, underscore the stakes that each side has in keeping this vital relationship stable and moving in a mutually beneficial direction. Neither side can afford to go wrong on this one – a conflictual Sino-Indian relationship would fracture Asia. But reports of the fresh transgression and the lining up of troops in the Chumar sector of the border, even as the Chinese President was on Indian soil, did contribute to a lowering the bar – though it would be overstating the case to say that they led to the visit and the agreements falling short of expectations. After all, most of these agreements would have been formulated well ahead of the troop movements. If one were to slightly shift focus from the Modi-Xi dynamics, it is clear that the hardy perennials in the relationship – the disputed boundary and the Tibetan factor – will necessarily intrude into the efforts to anchor mutual ties into a firmer economic base. The question is whether the two countries can constructively steer the relationship forward on parallel tracks. One, where the disputed issues can continue to be discussed within the frameworks and mechanisms devised since 2003 and in the spirit of mutual adjustment and mutual accommodation. Given that there is a whole world of common agendas and common interests bringing them together – from “zero tolerance to terrorism” at one end to cooperation in space technology at the other, the chief challenge would be to keep the dissonances emerging in first track from spilling on to the second. This had in fact appeared to be the general implication of the statements made by Modi with regard to China since his assumption of the post of prime minister. The Joint Statement issued after the meetings underlined the need to settle the boundary dispute early and reiterated that this is the most important strategic objective for both. From the standpoint of the intent to commence a new phase in the India-China relations, it may be said that the glass is certainly half full. The announcement of $20 billion in investments did take some aback. And yet is important to keep our responses within an economic and commercial framework. While the political impact of exorbitant pledged sums cannot be ignored, sober thinking will inevitably make one reflect on the fundamental restructuring and the systemic changes needed in India – not to mention generating the necessary political consensus prior to actualizing the proposed investment. An amount of $20 billion is not insignificant and India would have to establish its capability to absorb that – and then more – with speed and dispatch. Credibility and ability, not foreign investment, is at stake. This would apply in the Japanese case as well, and they are reportedly far more fastidious as regards these matters. Importantly, there was due emphasis in the Joint Statement on the need to not only deepen but also balance the bilateral trade – an area of concern given the huge deficits that India has been sustaining. It is also very heartening to see that the historical civilizational and cultural ties were foremost in shaping the relationship. Both leaders referred to the significance of age-old contacts and the importance of studying each other’s history and culture. A new route to Mansarover Kailash – a religious region of pilgrimage along both nations’ borders – through the Nathu La Pass in the Indian state of Sikkim (in the Himalayas) will be music to many religious and spiritual ears – as will the freer flow and exchange of scholars, and expansion in the opportunities for learning of each others’ language. In keeping with an established trend, the itinerary of visiting Chinese leaders includes an outreach to the general public. Two dimensions were discernible: First, in Towards an Asian Century of Prosperity, an article written by Xi and published in an Indian national daily on the day before he arrived in Ahmedabad, the Chinese President expanded on the India-China economic cooperation and his belief in India’s enormous growth potential under Modi’s dynamic leadership. This was an acknowledgement of the reputation that Modi enjoys in China. Following the one-on-one meeting and the delegation-level talks, Xi also delivered a public lecture to a select audience under the aegis of the Indian Council of World Affairs, presided over by the Vice-President. He praised India’s glorious cultural traditions and its civilizational links to China. He quoted from literary icon Rabindranath Tagore’s poetry, touched upon Gandhi legacies and most interestingly, referred to ‘vasudaiva kutumbakam’ (the world is one family) as reflective of India’s emphasis on universal peace and harmony. He clearly was aware of the resonance of this phrase in the ruling Bharatiya Janata Party’s ideology. A first for a Chinese leader, there was a distinct appreciation of Indian spiritualism that also came across strongly. But there was another message – China’s interests in South Asia’s prosperity and its intention to increase trade with this region to upwards of $150 billion over the next five years. Xi referred to the imminent Indian membership of the Shanghai Cooperation Organisation (SCO) and expressed his hopes for playing a more concrete role in the South Asian Association for Regional Cooperation (SAARC). The quid pro quo was unmistakable. On the whole, the speech came across well in foregrounding the significance of the historical and cultural aspects. There was yet another low-key, though significant, public ceremony. 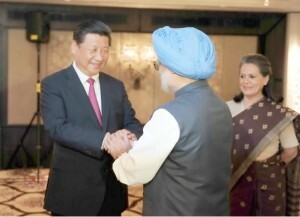 Under the aegis of the Chinese People’s Association for Friendship with Foreign Countries, Xi also presented the Five Principles of Peaceful Coexistence Friendship Award, to commemorate the 60th anniversary of the signing of an agreement – known in India as the Panchsheel Treaty – to maintain peace and stability along the shared border. The Award was given to the 93-year old widow of Dr Dwarkanath Shantaram Kotnis, a physician who had traveled to China during its conflict with Japan in 1938 and had died there just four years later. She was specially flown in from Mumbai for the ceremony. It was public outreach and a photo op at its emotional best – the tall Chinese President bent over the wheelchair-bound lady; he held her hand for nearly two minutes while she haltingly expressed her thanks. Meanwhile, the 16 agreements signed during this visit cover a wide range of sectors and reflect the expanding and deepening nature of the cooperation. What will be watched keenly is the follow-up in the period ahead. Modi’s decision to match the “skill, scale and speed” of Chinese achievements will begin with the process of implementation of the scores of memoranda of understanding signed between them over the years, and which have yet be operationalized to an optimum degree. The strategic transition unfolding in Asia – the rise of China and the US pivot – will need deft handling. No less adroitness would have to be demonstrated in the context of the Chinese big picture – its strategy of recasting the historical Silk Roads, and taking the lead in formulating a comprehensive framework for multi-dimensional engagement with and in Asia. India has to work out its response and position here. Professor Alka Acharya is Director and Senior Fellow of the Institute of Chinese Studies at New Delhi’s Jawaharlal Nehru University (JNU). She is the author of China & India: Politics of Incremental Engagement. She was a member of the India-China Eminent Persons Group (2006-2008) and member of the National Security Advisory Board (2006-2008) and (2011-2012) of the Government of India.